Curvilinear motion is defined as motion that occurs when a particle travels along a curved path. The curved path can be in two dimensions (in a plane), or in three dimensions. This type of motion is more complex than rectilinear (straight-line) motion. 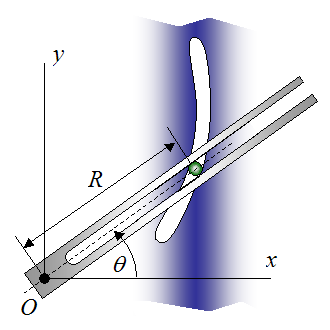 Three-dimensional curvilinear motion describes the most general case of motion for a particle. To find the velocity and acceleration of a particle experiencing curvilinear motion one only needs to know the position of the particle as a function of time. As you can see, if we know the position of a particle as a function of time, it is a fairly simple exercise to find the velocity and acceleration. 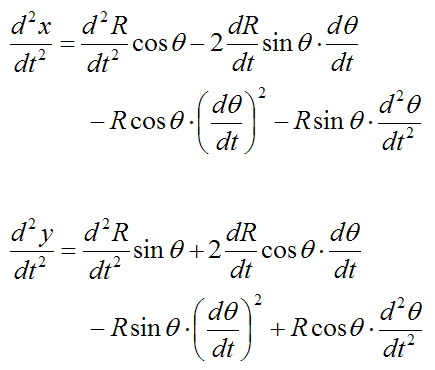 You simply take the first derivative to find the velocity and the second derivative to find the acceleration. Note that the direction of velocity of the particle P is always tangent to the curve (i.e. the path traveled, denoted by the blue curve in the figure above). But the direction of acceleration is generally not tangent to the curve. where R is the radius of curvature of the curve at a given point on the curve (xp,yp,zp). 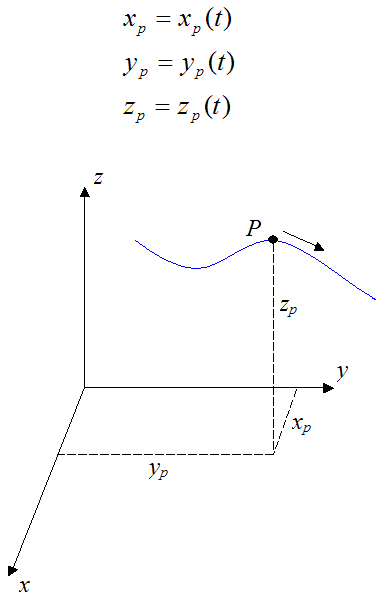 The figure below illustrates the acceleration components at and an at a given point on the curve (xp,yp,zp). where |x| means the “absolute value” of x. For example, |-2.5| = 2.5, and |3.1| = 3.1. 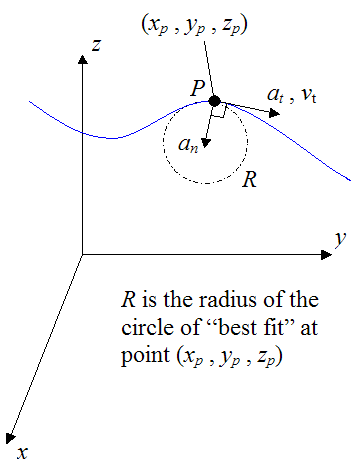 However, it is usually not necessary to know the radius of curvature R along a curve. But nonetheless, it is informative to understand it on the basis of its relationship to the normal acceleration (an). 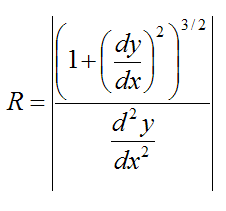 It is sometimes convenient to express the planar (two-dimensional) motion of a particle in terms of polar coordinates (R,θ), so that we can explicitly determine the velocity and acceleration of the particle in the radial (R-direction) and circumferential (θ-direction). 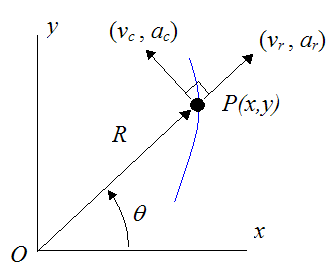 For this type of motion, a particle is only allowed to move along the radial R-direction for a given angle θ. 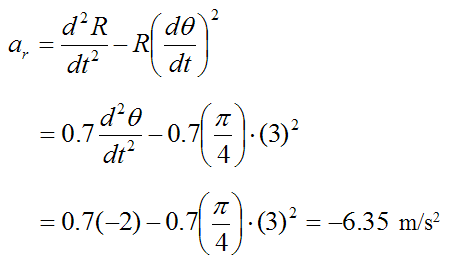 For a particle P defined in polar coordinates (as shown below), we can derive a general equation for its radial velocity (vr), radial acceleration (ar), circumferential velocity (vc), and circumferential acceleration (ac). Note that the circumferential direction is perpendicular to the radial direction. 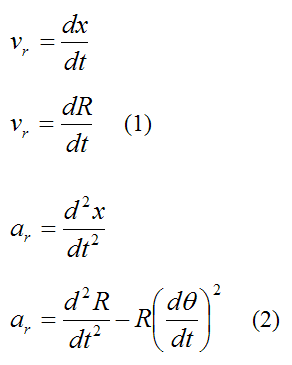 Without loss of generality we can evaluate the velocities and accelerations at angle θ = 0, knowing that (at this angle) radial velocity and radial acceleration is in the x-direction, and circumferential velocity and circumferential acceleration is in the y-direction. Equations (1), (2), (3), and (4) fully describe the curvilinear motion of a particle P in polar coordinates. The term dθ/dt is called angular velocity. It has units of rad/s. One rad (radian) = 57.296 degrees. 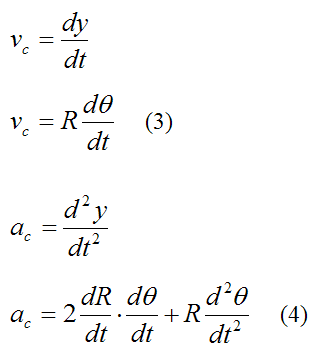 The term d2θ/dt2 is called angular acceleration. It has units of rad/s2. The angle θ = 45° is equal to π/4 radians. 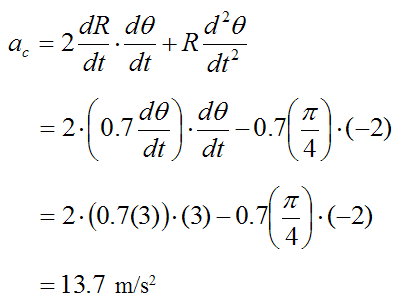 In the equations, counterclockwise angular velocity is positive, and clockwise angular acceleration is negative (since it acts to “slow down” the rotational speed of the link). (The radial velocity is in the direction of increasing R). (The circumferential velocity is in the direction of increasing θ). 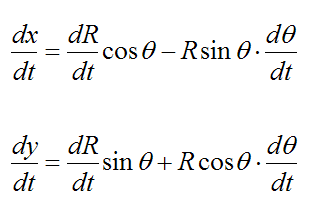 (The radial acceleration is in the direction of decreasing R). (The circumferential acceleration is in the direction of increasing θ).